The requirement for a miniature, high density, long life, and rechargeable power source is common to a vast majority of microsystems, including the implantable devices for medical applications. 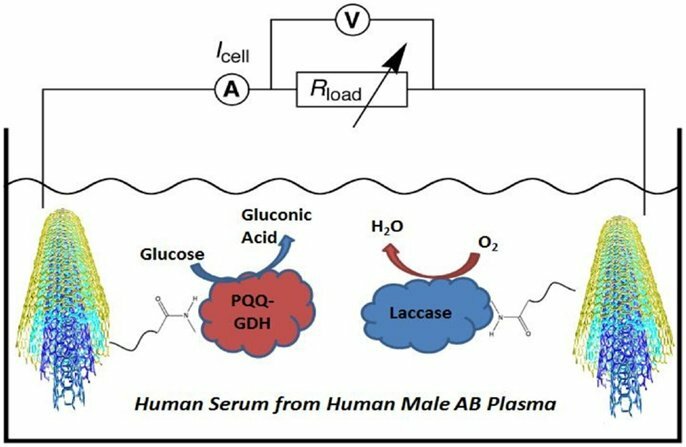 A model biofuel cell system operating in human serum has been studied for future applications of biomedical and implantable medical devices. Anodic and cathodic electrodes were made of carbon nanotube-buckypaper modified with PQQ-dependent glucose dehydrogenase and laccase, respectively. Modified electrodes were characterized electrochemically and assembled in a biofuel cell setup. Power density of 16.12 μW cm−2 was achieved in human serum for lower than physiological glucose concentrations. Increasing the glucose concentration and biofuel cell temperature caused an increase in power output leading up to 49.16 μW cm−2.